Elad Lassry's highly disciplined practice revolves around the nature of human perception. While his two-dimensional work stems from the creation and rediscovery of imagery from various sources, it always lends itself to reinterpreting the meaning of the image in contemporary culture. Although Lassry's iconic pictures are on their own flat, they are consistently presented in three dimensional artist's frames, which makes each work read as sculptural. Following the same trajectory into the third dimension, Lassry's cabinet series are, in fact, a similar dimension to his pictures. Similarly, the artist's pictures are often presented in a horizontal sequence. Along the same lines, the cabinet series achieves a parallel exploration of form. These discrete objects function as cabinets of curiosity in the third dimension. The present lot, executed in a Rosewood of rich, variable brown tones, is comprised of a material that he often revisits in his flat work. 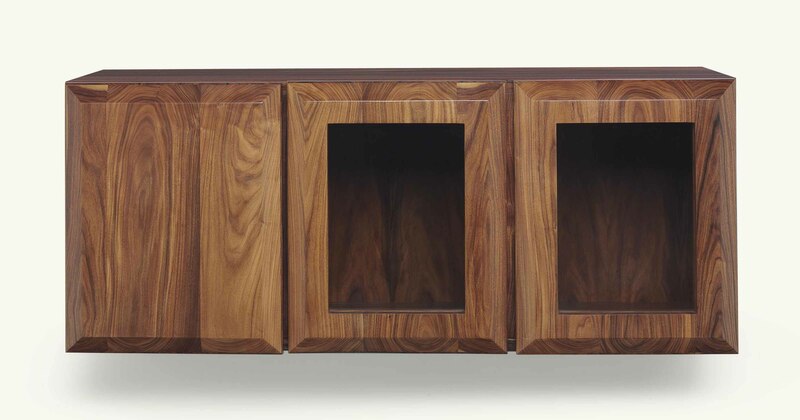 In Lassry's Untitled (Rosewood Cabinet) the void interior allows for one's imagination to fill the space. The viewer's perception of this deep, seemingly utilitarian object, invites one to question the line between art and everyday object. It is a strong example of the artist's practice in three-dimensional form.